Traditional Chinese Medicine is the oldest form of healing known to mankind with a history of over 5000 years of use. All the treatments consist of nature therapies and all the medicines are found in nature, making Chinese medicine the world’s oldest, safest and most effective natural system of medical care. Our Doctors are fully qualified to diagnose and treat a wide range of ailments in Chinese medicine and have over 20 years of extensive clinical experience. We provide a high standard professional medical service and bring the benefits of Chinese medicine to the local community in Walthamstow London. 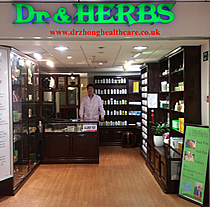 Dr Zhong Health Care Clinic situated in Selbourne Walk Shopping Centre in Walthamstow, brings a comprehensive range of traditional Chinese Herbal Medicine and Treatments for a range of health issues. Treatments include acupuncture, acupressure, cupping therapy, ear candling, and Tuina massage. We can help with a variety of health problems. Arthritis / sciatica / back pain / stiff neck / joint sprains / tennis elbow / muscle strain / frozen shoulder / slipped disc / joint problem / sports injuries /etc. Chinese Medicine and our Clinic in Walthamstow can help with these problems. For more details on your Treatments and pricing please visit our Treatment Page.